Spring Surprise – A New Little Hydrangea Plant! As I uncovered the leaves from the base of the Blushing Bride hydrangea, I found that a couple of the branches had formed roots which will be new plants! This form of ‘root layering’ or ‘ground layering’ is a great way to start a new shrub from an established one. It’s bare and spindly looking stems are curving out from the center and then upward and at least two of them were touching the ground enough to form roots. 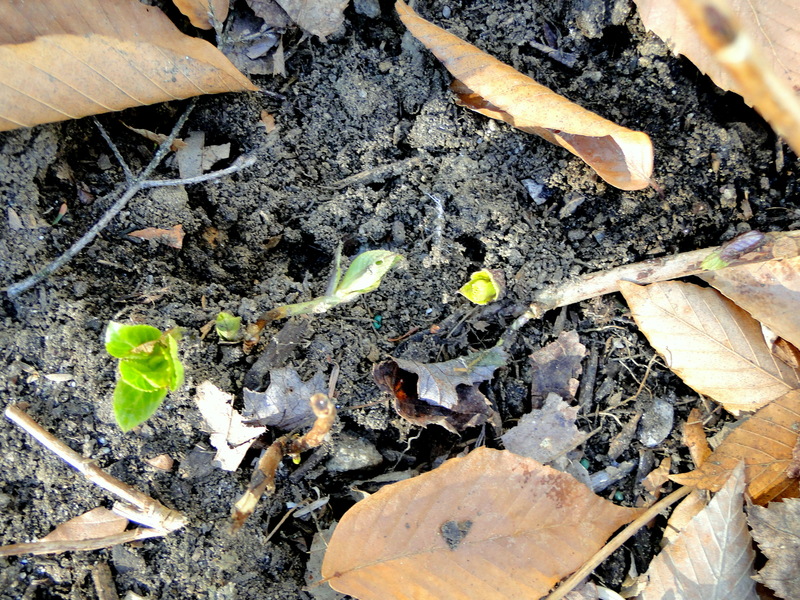 Now, new growth is showing beyond the roots which means I will have a couple of new little baby hydrangea plants! I have propagated hydrangeas this way before, back when I lived in my rental house. I had found a rooted stem with big leaves and a flower that was growing separate from the main bush, so I dug it up and planted it near the front steps. You can read about how I did it on my Propagating Hydrangeas page about root layering. So for now I will let the babies grow – attached to the main plant – until they get larger. I’ll probably dig them up in the Fall and find them a place to grow on their own. I love to find free ways to landscape. Isn’t that exciting?